Researchers at Dundee University have worked hard to develop a smoke alarm with a low pitch alarm sound and a voice message that helps to wake up children if there is a fire at night. The most successful alarm version, the researchers found, was a combined low pitch sound followed by a female voice saying ‘Wake up, the house is on fire’. A laudable project and the fruit of it will hopefully help families in the future to improve the safety of their children. While we are greeting this development as an important break-through, we analysed the issue at hand a bit further. Having early notification of a fire is only one element to ensure you and your children have the best chance of surviving a house fire. Teaching your children, including very young ones, what to do on hearing the alarm will prevent them from panicking and from walking out of their bedroom into a potentially dangerous situation. You may decide that the best route of action is for your child to stay in their bedrooms and to wait for you there or for them to make their way to your room ready to evacuate. No matter what your course of action, it is imperative that children have been given clear instructions and that the fire drill is practiced. It is essential that both parents and children get notified of a fire immediately. The best way to achieve this is to have the smoke alarms interlinked throughout the house. 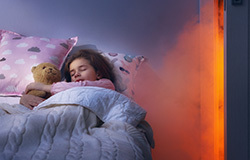 So, if a smoke alarm is triggered in a child’s bedroom or anywhere else in the house, the alarm would not only be raised in the bedroom of the child but also in the parents’ bedroom. Interlinking gives the maximum warning time to the parents even if, for example, a fire starts in the downstairs kitchen. This is crucial when every second counts. Interlinking can be achieved in a traditional way with wires spanning from alarm to alarm, however, easier options are now available with battery powered radio-interlinked smoke alarms being a simple-to-install solution. Whilst we wait for this new smoke alarm to progress through the developmental stages we should make sure that our own current fire safety precautions and evacuation plans are reviewed and where possible improved upon. For further advice about fire safety in the home you can visit our fire prevention page.